Current version – Grabilla 1.19, download now. Add a shortcut to taskbar! Check this 30 seconds video how to do that. Check out this release that brings Grabilla to new level of usability. 27 new features and bug fixes. 2012-09-03 (ver 1.15) Download Now! Holding “Alt” during screenshot do alternative action. You can hold Alt button when making screenshot to make an alternative action – it has separate configuration options. Add settings dialogue. You can configure Grabilla default and alternative actions. Remove “Open video” option. This feature was really confusing because after watching captured video it was very hard to locate it. So now you can upload it or choose a folder where to save it. Enable sound recording option. You can switch off sound recording when capturing video. Check requirements during installation. We checking for pre-requisites before installation to ensure that Grabilla will run smoothly. we provide a link to Windows Media Player download from Microsoft’s site. Move tray “Stop Recording” button on screen. Stop Recording button now moved out of tray for better visibility. Border for video recording region. Now you can see a part of screen that is captured during the video recording. Due to codec limitations this is not configurable, sorry. We can only switch it on and off. Upload video with command line – .wmv, 20 Mb max. We have added a possibility to upload video files from command line – “grabilla.exe video.wmv”. Current limitations is .wmv format and 20 megabytes per file. “Video mode” unchecked by default. Screenshot capturing happens more frequently than video capturing, and we all tend to forget un-check Video mode checkbox. Upload progress bar. You can see what’s happen after capturing. Move captured files to user’s documents library – “Grabilla Captures“, add short-cut to the start menu. Now all you captured screenshots and videos are stored in single place that you can easily locate. Do not put local link to clipboard until server response come. We create a local file with the same name as on server. Fix non-Latin letters in user account name. To support international users. “Save local copy” option. You can save your screenshot locally without uploading, for further editing. You can drop your edited file on Grabilla short-cut to upload it later. Link to the captured files folder in settings dialogue. 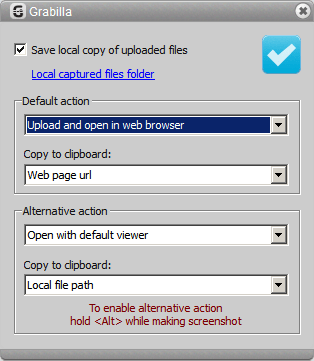 You can now open your local folder with your captured files from settings panel. Name local files like server name. Local files now have the same name as on server. Move app forms with a mouse. You can now drag Grabilla form. Improve network feature. For better and faster networking. Fix crash on network disconnect. If you lose connection Grabilla now won’t crash. Retry for network error message box. You can retry upload when something interrupts it. Install per user. We have changed default installation path from “Program Files” (which require Admin user rights) to your default user profile, like Google Chrome do (no need to be Admin on PC and do not trigger UAC warning). Add “Code for site” and “Code for forum” copy to clipboard options. If you frequently post your screenshots on forum or on your blog, this feature may be very useful for you. Colour under cursor in #ABCDEF format. We have got a request for this feature on feedback page. Now you can see the colour of pixel that is under cursor in HTML format. Assign hot-key during installation. Now you can choose what hot-key will bring up Grabilla during installation. Then you can launch Grabilla instantly from your keyboard.